The Zambian government has recently awarded British company Tullow Oil Plc (LSE:TLW) with a hydrocarbon exploration license in the country’s northern province. The license allows the company to undertake exploration activities in the Block 31 that is located on the East African Rift System (EARS) in the Lake Tanganyika region. The company expects to invest a minimum of USD69m during the exploration phase that will last for two years. The investment will be on geological and geochemical studies, passive seismic and Full tensor Gravity (FTG) surveys, Tullow Oil Exploration Vice President, Dr Ian Cloke, explained. The block offers a good prospect and both the government and Tullow Oil believe on the high potential it represents due to successful explorations on the same region in neighboring countries, Zambia’s Minister of Mines, Energy and Water Development Bwalya Yaluma explained. The exploration phase will also support Zambians to earn technical expertise and the government will ensure that this stage will be transparent and benefit local people, Minister Yaluma added. According to Tullow Oil, the main explorations areas will be around Laks Bangwelu, Mweru Wantipa and Tanganyika. 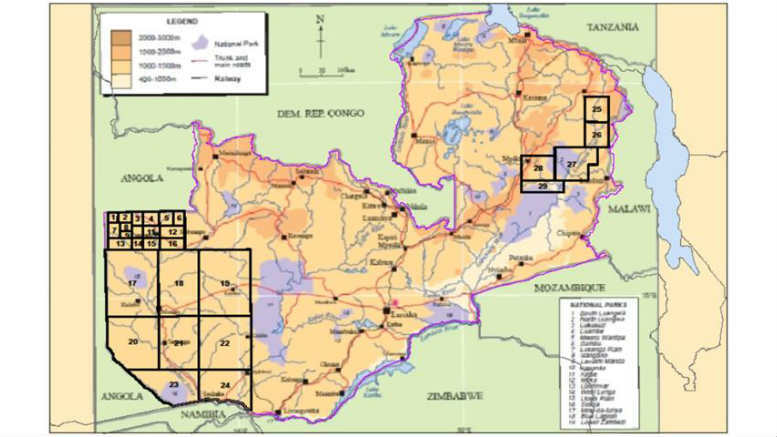 Swala Energy of Australia was the other company bidding for the hydrocarbon exploration license on the block 31 in Zambia. However, they decided to leave the country in September 2015 as part of a cost reduction program to focus on core areas in Tanzania and Kenya. They had proposed a total investment of USD23m and holding an 83% interest in any block awarded. Other blocks with high hydrocarbon potential are the 44 currently managed by local Zambian shareholders, the 34 by Frontier resources, 42 by Surestream, 40 and 41 by Rift according to the website Globalshift. Minister Yaluma has announced that the government will review the Petroleum (Exploration and Production) Act 2008, to tune fiscal terms and promote oil and gas exploration in the country. Tullow Oil is an Africa focused hydrocarbon exploration and production company with operations in Ghana, Congo, Ivory Coast, Equatorial Guinea, Gabon, Kenya, Uganda and Zambia. Zambia does not count with estimated or proven oil reserves. However, blocks located on the EARS are believed to be high potential prospects due to discoveries from neighboring countries in the same area.